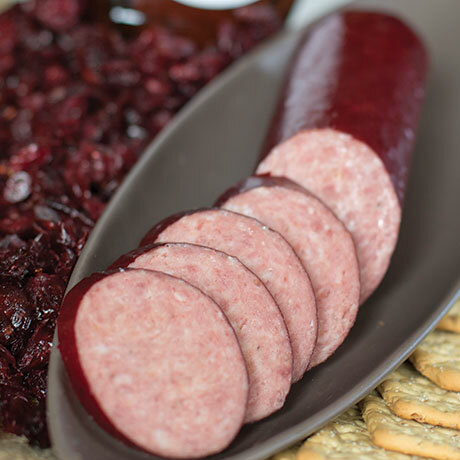 Elk and pork mixed with spices, maple, and cherry flavors for an amazing snack! 10-ounce stick. PORK, ELK, CHERRY SYRUP [HIGH FRUCTOSE CORN SYRUP, WATER, NATURAL AND ARTIFICIAL FLAVORS, CITRIC ACID, SODIUM BENZOATE AND ARTIFICIAL COLORS (RED 40 AND BLUE 2)], MAPLE SUGAR [SUGAR, MAPLE FLAVOR (CARAMEL COLOR AND NATURAL FLAVORS)], SALT, WATER, CITRIC ACID, ONION, SPICE, GARLIC, SODIUM ERYTHORBATE, STARTER CULTURE, SODIUM NITRATE.